Created a unique method of interpreting muscle activity in order to classify human gestures to control a robot. Gesture control is becoming a popular technique integrated into the growing area of virtual reality and rehabilitation. The popular Myo Armband achieved this using Electromyography (EMG) sensors placed on the forearm. However, this device was recently discontinued from production, leaving a gap in the marketplace. 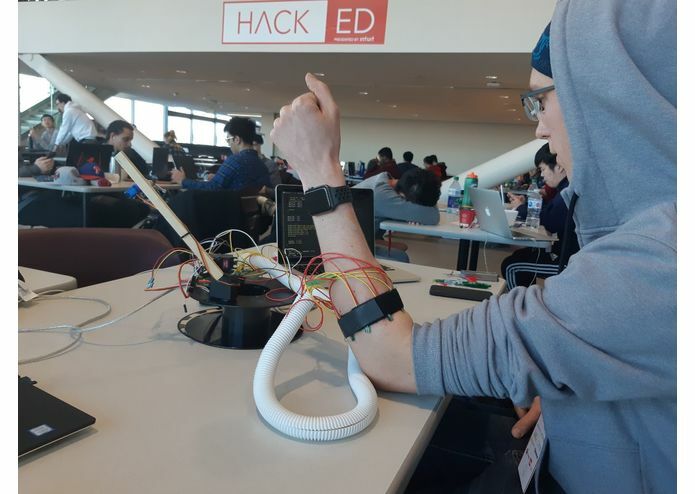 We achieved the same result as the Myo Armband, using a unique method involving Force Sensitive Resistors rather than the expensive EMG sensors. These sensors are much cheaper compared to EMG sensors. They are wrapped around the users forearm and measure pressure changes resulting from different muscle configurations. We use a desktop robotic arm in order to demonstrate the gesture control.